Water Supply and Operations | ECORP Consulting, Inc.
ECORP works with clients and local, regional, state and federal stakeholders using tools developed to understand project and water supply operational goals, objectives, regulatory requirements, and institutional and physical constraints to develop sound information promoting successful decisions. From a hydrologic modeling perspective, ECORP is skilled in many operational modeling platforms (such as OASIS and HEC-ResSIM) as well as the development of custom modeling applications used for water supply operational planning and analysis. Water Supply - Evaluation of existing and supplemental water supply through reoperation of existing projects or new minor and major project features. Hydropower - Operation, planning, and feasibility evaluation of modified and new projects. FERC Licensing - Pre- and post-licensing services including project operational alternative analysis for resource impact evaluation. Water Rights - Technical support for water rights strategic planning and state proceedings. 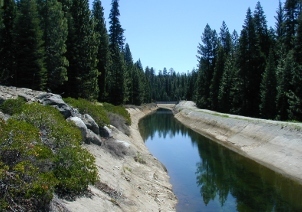 ECORP utilizes advanced technologies to understand water supply and hydropower project operations, revenue, hydrology, hydraulics, and environmental concerns, with interdisciplinary studies in economics, water law, and natural resource science to help maneuver through “big picture” water resources project planning, management, and operation.